Last week, the Kampung Pantai community leaders and representatives met up to discuss issues affecting Kampung Pantai. They cited Pantai Hill Orchard Resort as an ongoing concern needing attention. 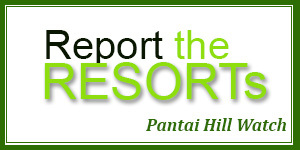 They are worried that resorts on Pantai Hill may be generating a ‘BAD’ name for Kampung Pantai at large.